WASHINGTON – The United States Mint (Mint) will release the second coin in its Preamble to the Declaration of Independence Platinum Proof Coin Series on January 31 at noon EST. 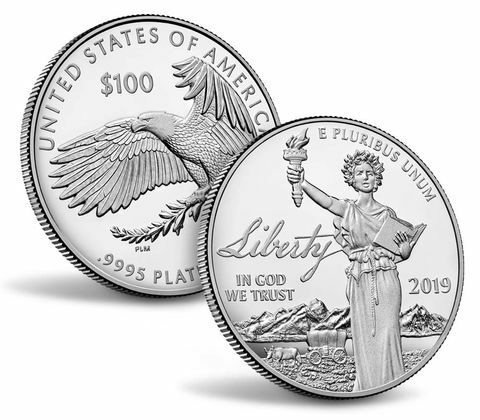 Launched in 2018, this three-year platinum proof coin series features all new obverse (heads) designs created concurrently by one designer and a new common reverse (tails) design. The reverse (tails) design of all coins in this series depicts an eagle in flight with an olive branch in its talons. Inscriptions are “UNITED STATES OF AMERICA,” “$100,” “1 OZ.,” and “.9995 PLATINUM.” AIP designer Patricia Lucas-Morris created the design, which former Mint Sculptor-Engraver Don Everhart sculpted.